In a Nutshell: Thomson Reuters, a global media and information distribution company, is known as a trusted source of real-time financial information to business leaders and market makers worldwide. To further this cause, Thomson Reuters created a proprietary financial analysis platform it calls Eikon that combines built-in collaborative tools and powerful research capabilities with access to news, data, and analytics from hundreds of markets and thousands of sources globally. Eikon’s intuitive interface and mobile-friendly presentation allow for fast access from anywhere in the world, giving decision-makers the confidence to act on opportunities. This is why we’ve chosen to recognize Eikon with our Editor’s Choice™ Award for Top Professional Market Data Software. Thomson Reuters is considered to be one of the leading providers of business and financial market data in the world. Known as “The Answer Company,” it is one of the most trusted sources of real-time information, analysis, and news for the business community. The Reuters News Agency alone employs 2,600 journalists around the globe, and a combined 50,000 employees contribute to the organization overall. The Thomson Reuters Corporation is the result of the 2008 acquisition of the Reuters Group by the business information provider, Thomson Corporation. Reuters was founded in London in 1851 as a company that provided stock market quotes, while Thomson is a Canadian company that began as a single newspaper in the 1930s. At the time of the acquisition, the companies had grown into two of the largest information providers in the world. The combined company consists of eight divisions that provide financial information, research, media, intellectual property, and risk management solutions to organizations worldwide. As part of its suite of offerings, Thomson Reuters developed the Eikon market data analysis tool in 2010. This desktop-based platform is designed to provide financial professionals with all the tools they need to monitor, research, and analyze market information. Since its introduction, Eikon has gained both recognition and market share over similar research products. Michael Chin, Managing Director and Co-head of Trading for Thomson Reuters, had this to say about the Eikon platform. 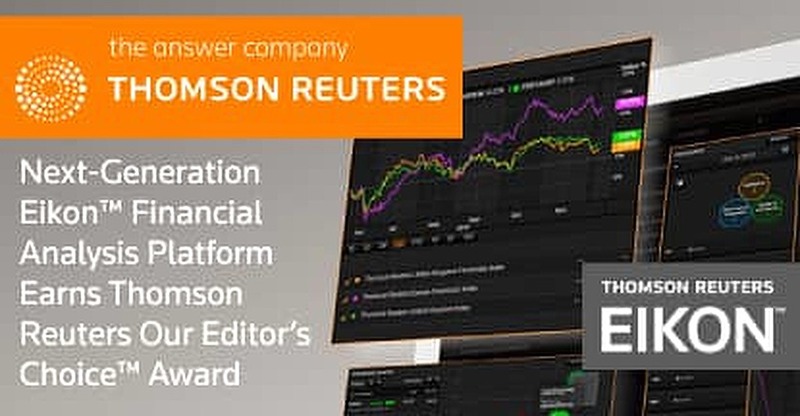 The Eikon financial analysis platform was developed by Thomson Reuters to be a comprehensive tool that provides financial market professionals with the insights they need to make informed decisions. Through its award-winning news, analytics, and data visualization features, Eikon helps users navigate the complex relationships that exist within global markets. Some of the additional features and capabilities of this powerful platform include a mobile device feed and Google Chrome extension, which allow for personalized views on the go. A social media monitor extension also tracks and graphs any chatter involving companies or markets that may be of interest to investors. Built-in collaboration tools allow financial professionals to communicate in real time directly through the interface. Another advantage of the platform is Eikon gives users access to Lipper content and Lipper fund data. Lipper, acquired by Reuters in 1998, provides the most comprehensive global fund coverage of ETFs, mutual funds, hedge funds, closed-end funds and pension funds on the planet. Lipper also sets the standard for integrity for its content, as a result of stringent processes and adherence to Thomson Reuters Trust Principles. From streaming real-time data to providing access to extensive fundamental analysis, Eikon offers users trusted, timely, and accurate content. The Eikon database covers more than 22,000 companies and more than 99% of the world’s market cap. No other platform offers better access to unbiased Reuters news, direct exchange feeds, instant market pricing, and complete financial market analysis — plus an intuitive desktop and mobile interface by which to access it. Introduced in September of 2010, Eikon was the result of a nearly $1 billion investment by Thomson Reuters. The initial rollout was not without its challenges. Philip Brittan, former Global Head of Desktop and Mobile Platforms at Thomson Reuters, admitted that there was some “teething” pain early on. “There is a process to maturing technology and getting the early kinks worked out,” Philip said in a 2011 interview. “There was no one smoking gun that everyone experienced, just some little things like ‘This isn’t showing up right’ or ‘When I do this giant flex sheet, it uses a lot of memory,’ or ‘The layout on screen isn’t how I want it. '” As he later explained, those initial challenges were quickly worked out. Through subsequent feature updates and performance improvements, Eikon has continued to evolve into a refined, fully featured analysis platform. Eikon delivers all of the data an investor could want by combining Thomson Reuters’ unparalleled news and research capabilities with powerful charting tools, global pricing data, and deep analysis of market fundamentals. Extensive research filters allow searches based on a variety of contexts. With more than 40 million individual items available, Eikon uses complex tagging and cross-referencing of data to deliver the most relevant information possible to its users. Thomson Reuters is one of the most admired and respected sources for in-depth news and financial information in the world. It was named one of the World’s Most Ethical Companies by the Ethisphere Institute for seven consecutive years. In addition, FORTUNE Magazine has named Thomson Reuters to its list of the World’s Most Admired Companies, a ranking of corporate reputations, for eight consecutive years. Companies turn to Thomson Reuters for its unmatched coverage of global economic conditions. In a recent interview, Daniel Burns, Reuters Editor for Economics and Markets in the Americas, had this to say about the company. With its combined features, world-class analytics, and unrivaled news and market content, Eikon has evolved into a premier financial analysis tool for market professionals and traders. While similar products, like Bloomberg Terminal, are popular among financial professionals, Eikon stands out for its wealth of content and more affordable price point. Given this industry-leading combination, Eikon has earned our Editor’s Choice™ Award for Top Professional Market Data Software.